The Second Step (c. 8570-8610 m/28,120-28,250 ft.) is technically the crux of the Northeast Ridge route. The initial climb up the step involves a 3 m high slab to the right of a narrow chimney, surmounted by ways of a narrow ramp and a short rock step. 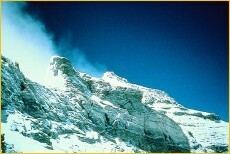 A prominent snow patch, some 7-9 m (25-30 ft.) high and 50° steep, leads up to the foot of the final 5 m/16 ft. headwall. This is surmounted with the aid of an aluminum ladder installed by the second Chinese expedition of 1975. From the top of the ladder a tricky move onto a ledge leads to easier terrain below the top of the Second Step and close to the crest of the Northeast Ridge. © Dave Hahn (1994), from "Ghosts of Everest"
Until 1999, only one party was known to have climbed the Second Step without using the Chinese ladder, the Chinese team who made the first confirmed ascent of the step in 1960. But it hadn't been a free ascent, i.e. using only the hand- and footholds the rock had to offer, as the climbers used a shoulder stand and several pitons to overcome the headwall. Qu Yinhua, the leading climber, took of his boots and crampons to gain a better grip on the rock and avoid hurting his partner, later losing the front parts of both feet to frostbite. It took the Chinese three hours to surmount the last 16 feet of the Second Step. Film footage taken from above the step support their claim. 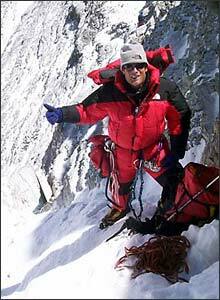 During his summit climb with Dave Hahn on May 17, 1999, Conrad Anker attempted a free ascent of the Second Step, i.e. in the same way Mallory and Irvine would have to have done. Both Anker and Hahn moved up the lower section of the Second Step independently, using the fixed ropes already in place, and did not consider it technically too difficult, probably 5.4 or 5.5 (UIAA III-IV-), according to Hahn. Yet Hahn also remarked that the technical difficulty is only half of the problem: the final unprotected step out of the ramp onto the central snow patch is extremely exposed, with the whole 8000 ft. of the North Face dropping away below. "First I tried going right, which looked like it was a line of weakness. But the rock was really loose and rotten, with bad fall potential. So I opted for the off-width that's just to the left of the Chinese ladder that was put there in 1975. And I was able to knee-bar to the top of it and got a size three-inch friend at the top of it and then I got a hand jam into the crack that I got the three-inch in, and then I had to step out. At that point the ladder was in the way. I had some edges in there, but I think due to the fact that I'm weak, more than anything, I stepped on the ladder. So one move of aid, but I did most of it free and I didn't have my pack and my cylinder on." How this concluding statement came about is unclear in retrospect, as after the expedition Anker expressed the opinion that Mallory & Irvine could not have climbed the Second Step in 1924. Even without the debilitating effect of altitude, 5.8 (UIAA V+) would have been at the upper level of Mallory's technical ability, 5.10 (UIAA VI+) clearly beyond - and in any case beyond anything we know of Irvine's capabilities. 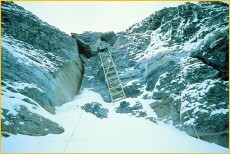 In Anker's opinion, the Second Step had been too difficult an obstacle for Mallory & Irvine to have climbed it in 1924.